Decide if you want to work with edging such as rocks or a fence. 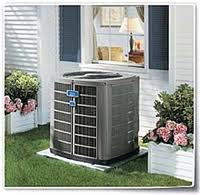 Choose plants that are taller than the height of the compressor (standard is 1-2 feet). If you choose immature plants, keep in mind how tall and wide they will be when they reach maturity. Mixing and matching shrubs with bushy perennials will help fill in the area and provide continuing color and greenery throughout the year. Select perennial plants or shrubs that require little to no maintenance and will stay or return each year. Astilbe grows in most plant hardiness zones. The plant reaches up to 29 inches in height and has a lush green foliage lasting throughout spring in summer. Puffy plumes of color in your choice of pinks, reds and whites appear throughout the summer. Hydrangea that reaches up to four feet in height. The hydrangea blooms in your choice of bright colored pink, white or blue spheres -- throughout the summer into early fall. Place plants at least 3 feet away from the compressor. Overcrowding of plants and shrubs will block air flow in and out of the compressor -- leading to overheating and permanent damage to your central air system.